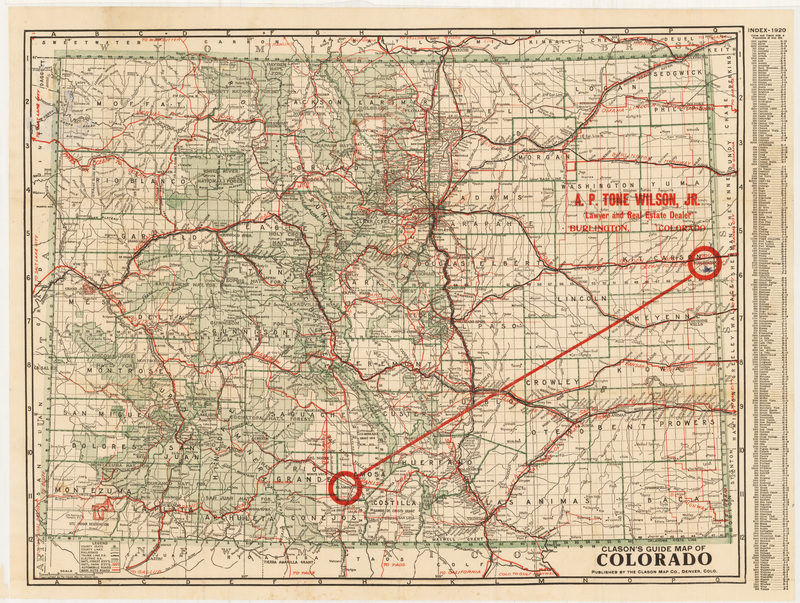 Antique Map of Colorado Clason 1920 - theVintageMapShop.com - the Vintage Map Shop, Inc. This is a reproduction of an authentic antique map of Colorado by George Clason, an interesting figure who founded his own cartography company, and who published the first road atlases of the USA and Canada. His maps are attractive and highly detailed for their time, showing cities and counties, roads along with topographical features. An index showing cities and towns along with their respective population figures is on the right border. National forests are colored green and two red circle indicate the locations of office for A.P. Tone Wilson Jr. a Lawyer and Real Estate Dealer of the era.